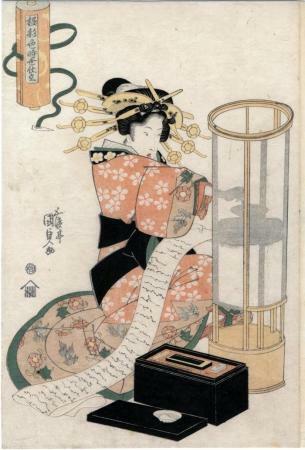 The courtesan, warmly dressed for a winter's day or night, is lighting a floor lamp so she can continue writing a possible love letter. Notice her writing set nearby with its brush, ink, stone. A cup holding water sits atop the lid of her black lacquer box resting on the ground. The title of the series appears as a label on the outside of a scroll in the upper left. A careful examination of the fabric covering the outside of the scroll shows the toshidama, Kunisada's seal. One of the more beautiful elements of this beautiful print is the green cord loosely unwound around the title scroll. At the end of the cord is the carved ivory piece used to secure the scroll when tightly closed. A wonderful touch.